Restaurant-quality food, easily made at home! This succulent dish will have your friends and family thinking they're dining at a five-star restaurant. The perfect dinner for that special someone, who will think you're a top chef! :) Pretty quick meal that tastes like you've been in the kitchen for hours! Rinse cauliflower, chop, and place in a microwavable-safe bowl. Add 2 tsp. water and microwave, covered, for 5 minutes. Remove, let cool slightly, and transfer to a food processor. Add half and half, 1 tablespoon of butter, parmesan, salt and pepper, onion powder, and garlic powder. Process until smooth. Set aside. (You can quickly reheat if it cools off too much). In a skillet over medium-high heat, add 3 tablespoons of butter. Sprinkle swordfish with salt and pepper. Once butter starts sizzling and the pan is very hot, add swordfish and thyme sprigs and sear on each side for 2 to 3 minutes, while continually spooning the melted butter on top of the swordfish while it's searing. Remove from skillet to a plate and sprinkle with lemon zest. In the same skillet, add last tablespoon of butter. Rinse scallops and pat dry. Sprinkle scallops with salt and pepper. Once butter starts sizzling, add scallops to skillet and sear for 1 minute on each side. Remove to a plate. 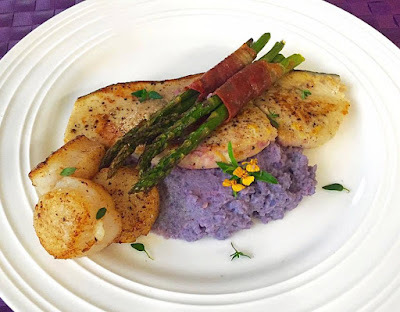 Plate your beautiful entree' with the creamed cauliflower, then swordfish, and then scallops. Garnish with parsley, basil, or tarragon. Enjoy!! If you'd like a printer-friendly version of this recipe, Click Here.